One of the best ways to strengthen your horse's top line, haunches, and cardiovascular endurance is to ride up and down hills--if you do it properly. The challenge to is make sure that you do it safely for both you and your horse, and that means knowing how to shift your weight so that you help rather than hinder your horse's movement. 1. 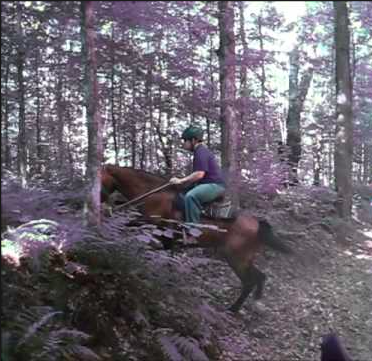 Make sure your horse is strong enough to handle riding up and down hills. One way to help your horse develop the muscle strength needed is to do cavaletti work at walk and trot. Start low, then raise them gradually. In order to walk or trot over raised cavaletti, the horse must use his shoulder and hind muscles. You will see them develop over time quite strikingly. Caveletti are also good tools for teaching the horse rhythm at trot. 2. Ensure that you are sitting securely as he climbs and descends. Otherwise, it is like trying to mountain climb with a loose backpack on your back. When he is climbing, go into two-point. That frees his back and shifts your weight forward so that he is pushing your weight up the hill rather than dragging it from behind. When he is descending, lean slightly back, but keep your legs positioned normally and securely on his barrel. That helps him balance himself evening rather than carrying all his and your weight on his forehand.